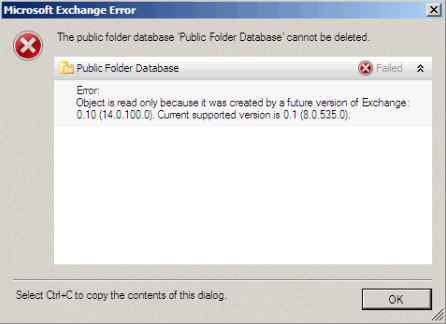 When you try to remove a Exchange 2007 public folder database after a migration to Exchange 2010 you’ll get a “Object is read only because it was created by a future version of Exchange: 0.10 (14.0.100.0). Current supported version is 0.1 (8.0.535.0).” error. Solution: Run adsiedit.msc goto configuration container CN=Configuration , CN=Services , CN=Microsoft Exchange , CN=First Organisation , CN=Administrative Groups , CN=Exchange Administrative Group (FYDIBOHF23SPDLT) , CN=Servers , CN=EXCHANGE2007SERVER , CN=Information Store , CN=Second Storage Group delete the CN=Public Folder Database. Posted in Blog, Exchange 2007, Exchange 2010 by ronnypot at August 27th, 2010.